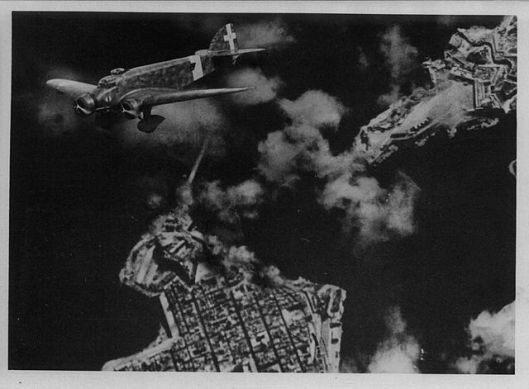 Italian bombing of the Grand Harbour, Malta. 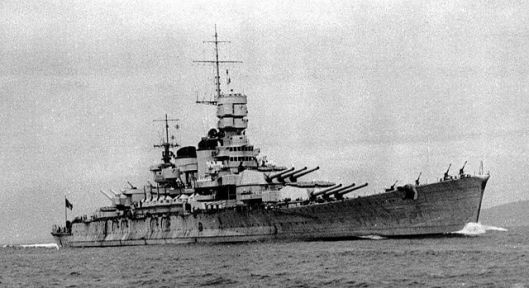 By June 1940, Italy’s battleship strength increased. The Littorio and Vittorio Veneto were completed, the last two of the Cavour class were completing modernization, and work continued on the new Roma and Impero. So now, with these new additions and the surrender of France on June 24, the situation in the Mediterranean changed drastically from what it had been nine months before, from nine Allied capital ships against four Italian, to six Italian capital ships versus four British. For Italy, control of the Mediterranean was essential. All its African and Middle Eastern objectives could be reached only across the sea, so the Italian Navy would play a pivotal role. The fleet itself was large, modern, and possessed a very good naval commando branch. However, despite its modern character, it lacked radar, sonar, and night fighting training. Its most serious deficiency, however, was the lack of aircraft carriers, which Mussolini believed were unnecessary. Furthermore, the Italian Navy was not allowed to have its own air units, like the British Navy’s Fleet Air Arm. For air support, it had to rely on the Italian Air Force and there was no effective coordination between the two services. Italian fleet commanders requiring air support had to contact the Admiralty, which then passed on the request to the Air Ministry, which, if it approved, would then notify the respective air units. The result of this cumbersome arrangement was that very often the Italian fleet went into battle with no air support at all. While this would be an important issue throughout the Mediterranean campaign, it should not have been an issue for an invasion of Malta, only sixty miles from the Italian bases in Sicily. Ample land forces for an invasion were available from among the forty plus divisions of the Italian army. Furthermore, the Italian merchant marine, with a total of 1,235 ships of approximately 3,500,000 tons, would provide sufficient shipping to transport and maintain an offensive, particularly one so close. The Italian Navy also supported invasion and since 1938 it had maintained that the occupation of Malta was a primary and indispensable condition for fighting any war against Great Britain. When war seemed imminent, the navy had presented a plan for the conquest of Malta to the Supreme Command. But the Supreme Command gave up this idea due to its opinion that the war would be a very short one, and also because it was believed that the Italian Air Force would be able to neutralize the island’s military effectiveness. Furthermore, Mussolini was a disciple of air power theorist Giulio Douhet, who believed that civilian populations could be bombed into surrender. Invasion, according to Douhet’s doctrine, was unnecessary. Bombardment alone would be sufficient and the Italian Air Force was deemed up to the task, with 2,500 to 3,000 aircraft, 1,500 of which were first-line aircraft ready for combat. There were 200 fighters and 350 bombers stationed only twenty minutes’ flying time from Grand Harbour. The bombing of Malta was the first Axis mistake and not invading at the onset was the second. Still, invasion might not have been necessary if a successful blockade had been imposed. Malta produced only 30 percent of its own food, and 70 percent of what it imported came from Italy and its North African colonies. In addition to food, fuel and munitions had to be imported. A major difference between the situations in 1565 and 1940 was that, while the knights and Maltese had ample supplies for the campaigning season, in 1940 the island had over ten times the population and was vulnerable to starvation. In this respect, the situation was more akin to the Maltese revolt against the French in 1798-1800. On the morning of June 11, the dockyard workers were streaming to the harbor to begin their shift, which started at 7 AM. At 6:50 the island’s sole radar set, positioned on the Dingli Cliffs, detected numerous aircraft approaching from the north. They were fifty-five tri-motored Savoia Marchetti 79s bombers, escorted by eighteen Macchi C. 200 fighters. Some of the attackers dropped their loads on Hal Far, while others bombed the Grand Harbour area. One bomb scored a direct hit on a gunpost at the tip of Fort St. Elmo, killing six RMA soldiers, Malta’s first army casualties. Other bombs hit Msida and Pieta. The worst damage was in heavily populated Cospicua. A second raid by thirty-eight bombers struck again later that afternoon. Altogether, there were eight raids that day. Two hundred buildings were completely or partially destroyed. Civilians composed the great majority of the 36 killed and 130 injured. Casualties would have been more severe, but the Italians used fifty-kilogram bombs. When the first raid hit, the dockyard workers were crowded by the main gate. When sirens wailed they first thought it was a drill. Then someone yelled, “Air raid! Come on, run!” The workers panicked and surged through the gate, rushing for shelter inside the dockyard compound. Here many found safety in tunnels dug centuries earlier by the knights to house their galley slaves. Others made the best of the partially completed deep rock shelter. The residents of Cospicua did not have shelters to flee to. No air raid drills had ever been conducted and many were confused about what to do. Many also panicked and fled to the Corradino highway tunnel a half mile away. Neither was there a plan for evacuating people from bombed areas. Thousands fled the Three Cities and Paola on their own. It is estimated that during the first two days of the war, between 60,000 and 80,000 people fled the Grand Harbour area. Many would return, but they would find it hard to ever feel safe in their homes again. An old railway tunnel outside Valletta was reopened and turned into an immense dormitory that served many of the capital’s residents, as well as those of nearby Floriana in the years to come. Tunnels were also dug out of the solid rock, some within the dense fortifications left by the knights. Individuals armed with pickaxes excavated smaller family shelters. These would have two entrances to reduce the chances of being blocked by debris. Many urban residents used old wells, dug before the construction of city water lines, for shelter. Those living outside the cities used caves, and in the Paola area the underground Hypogeum of the Temple Builders provided shelter. In time, more public shelters were also constructed. Many, however, never went into the shelters. Venerina Castillo of Marsa, for example, said that if she were to die, she wanted it to be in her home, and not in a hole in the ground. It is possible that, had the Italians launched a quick invasion at the outbreak, they might have seized Malta with little effective resistance. It is also possible that if they blockaded the islands and starved the inhabitants, the people may have reevaluated their relationship with the British, much as they had done with the Phoenicians and knights. But any goodwill toward Italy vanished with the bombing of Malta. Had the Italians struck only military targets it would have been different, but the first raids destroyed houses as well, homes that had been passed down over generations. Beloved churches were hit as well. After the first raid, the matter was settled. It was 1565 all over again, and the Maltese would make their stand beside the British, just as they had with the knights. Italy lost Malta with the first bomb dropped on a Maltese home. Stunning as the first raid was, there was another shock of a more positive nature. This was the appearance of three stubby little biplanes that rose to meet the intruders. In a modern version of David versus Goliath, these aircraft charged into bomber formations and even traded fire with the more modern Italian fighters. The Maltese soon named them Faith, Hope, and Charity. But where did they come from? In April 1940, the carrier Glorious left Alexandria for the North Atlantic in a hurry to support Norway operations and left behind some crated Sea Gladiators at the naval air station at Kalafrana. These were reserve aircraft for the carrier. Malta’s air officer, a New Zealander named F. H. M. Maynard, asked the navy to hand them over to the RAF for air defense. Although the aircraft were already assigned to another carrier, Cunningham approved four of them for Malta. A bureaucrat at the Admiralty actually inquired as to why he would allow Fleet Air Arm property to be taken over by the RAF. Despite such interservice rivalry, the four were assembled at Kalafrana and stationed at Hal Far, where the British succeeded in keeping their existence a secret. There were a dozen qualified pilots on Malta, although they were for the most part in administrative posts and had no fighter training. All volunteered and seven were chosen. The Gladiator had a top speed under 240 mph, a fixed undercarriage, all-steel fuselage, and an 840-horsepower Bristol Mercury engine. It was a rugged aircraft, armed with four .303 machine guns. The pilots called them flying tanks, while the Maltese thought that on the ground they looked like donkey carts. In the first few days, three of the planes were in action, with the fourth used for parts. Damage to the aircraft, plus the strain on those flying, led to a rotation of the pilots on three shifts of two pilots each, meaning that after the first week there were never more than two and often only one Gladiator in the air to meet the Italian raiders. During an attack they would climb to 20,000 feet and then swoop down into the bomber formation, using the dive to compensate for lack of speed. Officially, they were known as Station Fighter Flight Number 1. The pilots of Faith, Hope, and Charity were adored by the Maltese, and their newspaper photos adorned the pious Maltese homes alongside pictures of Jesus and Mary. Of the three, Faith is on display in the National War Museum. Of the seven pilots, two survived the war, Peter Keeble was killed over Malta on July 16, 1940; two others were killed in action in Belgium and Greece in 1941; another was killed in 1942 flying out of Gibraltar; and Peter Hartley was shot down over Malta and badly burned on July 31, 1940. The Italian air raids were sustained for a month and a half. There were 53 raids in June, followed up by another 51 in July. The raids tapered off afterward, but by the end of the year there were another 107 for a total of 211 Italian air raids against Malta in 1940, or an average of just over one air attack a day. Malta could not rely on the Gladiators forever. Fortunately, the British finally awoke to the need to hold Malta in the wake of France’s defeat. The aggressive Churchill had always advocated holding onto Malta and began to forward whatever air units were available to the island. Britain wanted to get Hurricanes to Malta and the only way was by carrier. The first attempt at this was Operation Hurry. On August 2, 1940, the old carrier Argus flew off twelve Hurricanes, and all arrived safely. This was done despite the fact that the Battle of Britain had been underway since July 10. Such operations, however, were not without risk. Three months later, in Operation White, the Argus carried another twelve Hurricanes for Malta, but only four made it on November 17, 1940. After takeoff the planes encountered a strong headwind, and eight ran out of gas, seven pilots losing their lives. Throughout the war, the British mounted a total of twenty-seven such operations, ferrying 764 aircraft to Malta in this way: 361 Hurricanes, 385 Spitfires, and 18 torpedo bombers. Of these, 718 reached Malta, 12 returned with the carriers, and 34 were lost. Not all stayed on Malta; 150 of the Hurricanes flew from the islands to North Africa to reinforce the Desert Air Force there. These reinforcements helped, but the air defense was always outnumbered by the enemy. From October 11, 1940, to February 10, 1941, the average number of fighters available for action was eleven.